﻿﻿﻿After a two month crime wave, I’m happy to say that we are back down to normal levels. After the big spike in home burglaries in July, we bumped up our ENP hours to 15 per week instead of the usual 10 hours. As a result, we were down in every category, but especially lower on residential thefts and burglaries. Unfortunately, we do not have enough members in the ENP program to maintain the higher level of patrols year round, so we have moved back to 10 hours a week. (Yes, that’s a plug for more members!) For more information on the program, click the ENP link on the menu above. Wednesday night, a bar patron was murdered and another shot after a fight that started in the bar currently named “Yucatan”. The fight spilled out into the parking lot at Greenville & Alta across from Taco Cabana (and about 100 feet from the office of yours truly). One of the suspects pulled a gun from his vehicle and shot the other. According to one report, a bystander was also hit in the chest by a stray bullet and a passing vehicle was damaged. This parking lot was the scene of a drive by shooting not too long ago. (I’ll have to check the dates, but I beleive this is the third murder in about two years on Lowest Greenville.) Those of you who receive the weekend report from Lt Martinez will recognize Yucatan because they show up virtually every weekend on the report. Police are searching for two suspects in the incident. This incident is still under investigation and I’ll try to get more information as it develops. Despite the ongoing attempts to create a Planned Development District to regulate the bars on Lowest Greenville, the bad operaters are showing no signs of backing down. While many of the business operators and others on their payroll are opposing this ordinance, the neighborhood associations unanimously agree that passing this PD is the only way to get rid of the few irresponsible operators who bring this crime into the neighborhood, like Yucatan. The Taste of Greenville event is being held this weekend near Richmond/Greenville. Since this is still a new and evolving event, LGNA requested some parking modifications for the area similar to those used for the St. Pat’s event. Temporary “No Parking” signs will be erected from Goliad south to Lewis and the cross streets to Ross. Same rules will apply as for St. Pat’s, including RPO restrictions. Anyone parking in the restricted areas will be ticketed and/or towed. There will also be multiple bands performing outdoors. If you have issues with parking or noise concerns, the organizer suggests calling 911 directly. Operators should know how to direct the call. As with all noise complaints, you need to specify the source and give your name for follow-up. 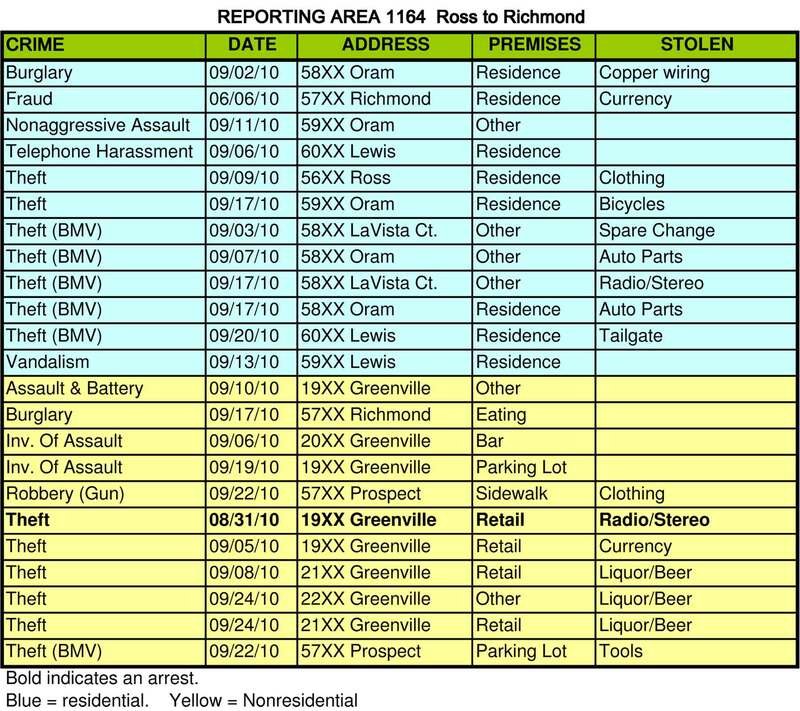 As I mentioned in a crime alert a couple weeks ago, there is a band of theives specializing in tailgate thefts. They have been working their way around town hitting neighborhoods in all parts of Dallas. 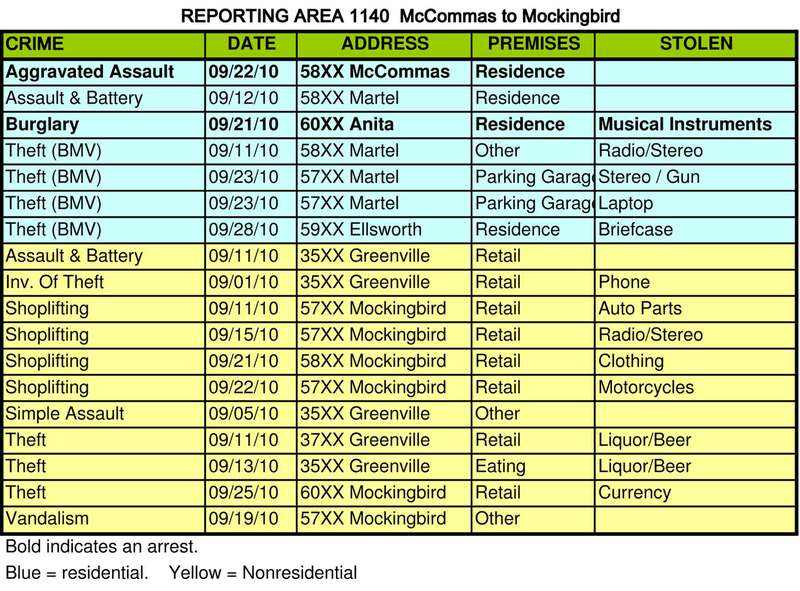 Ours was hit a few weeks ago and you can see at least one of those listed below. If you drive a truck, consider installing a tailgate lock. Wow, what can I say? Our National Night Out in Tietze Park was a big smash. We had a huge turnout and everyone had a great time. Police estimated 800 people were there. The entertainment was excellent as well. Thanks to all the sponsors and exhibitors as well as those who participated in the pie eating contest!